Game week 6 just goes to show what a difference a week can make in this game. Regardless of the transfers used the same players who let me down during game week 5 came good during game week 6. Only two players let me down really, this was Mane drawing a blank in two games and Shaw failing to pick up a clean sheet. Every other player either scored or kept a clean sheet, resulting in my highest scoring week of the season so far. This instantly boosted the team back to a more respectable position on the overall leaderboard after the huge drop last week. With injuries to Mendy and Pedro, I did end up using my three transfers for the month in one go. However I felt it was the right time to use them. This also softened the blow of missing out on Hazard’s hat trick. If I’d have made the transfers the week before, I would have taken out Van Dijk and B. Silva for Maddison and Hazard. I would have then missed out B. Silva’s 15 points this week and I would be stuck with Mendy and Pedro injured with only one transfer in the bag. I think being patient cost me points initially but has resulted in the team being set up better for the long term. All three transfers contributed 8 points. This put me 16 points better off than I would have been and hopefully going into game week 7 with no injured players. I’ve got a feeling some people are stuck with injured players until October after using all of their transfers early. The big three (Kane, Salah, Aguero) all got a goal each. This made a big difference this week as I think many people moved away from having all three in the same team. I’m hoping that keeping faith in the three of them will pay off in the long run. If all three managed two goals each in a given weekend this could have a huge impact on the overall leaderboard. Hart kept a clean sheet against Bournemouth. Any points from Hart is a bonus at this stage given his value but he looks to have made a decent start at Burnley. B. Silva came good with a star man performance against Cardiff. I was close to taking him out and had Pedro not got injured he may have gone. However I’m glad I stuck with him. There seems to be a lot going on at Old Trafford and I’m glad I didn’t got for Lukaku who I feel should have scored a lot more points given the game time and opposition he’s faced over the last couple of weeks. I do however have Luke Shaw. I’ve got a slight question mark next to his name given the teams poor form. Given his price I do plan to stick with him for the short term, as long as he can keep his place in the team. I think he’s still good value at the moment. Mane drawing a blank over two games is a concern. However his quality should come through so I plan to stick with him but monitor over the next few weeks. Having to swap Van Dijk for Maddison (to accommodate Hazard) didn’t seem quite right. Although Maddison scored, I’m not massively convinced he’s going to be a regular point scorer over the season. I can’t see him getting a goal every other game, however I could see Van Dijk getting that many clean sheets. To accommodate Hazard this had to be done. It’s not really an issue, more something to keep any eye on. The three “potential issues” above are only minor. Overall I’m very happy with the team I’ve got. At the moment I can’t see where I’d make any changes even if I had transfers to use. If you’re fortunate enough to have transfers for game week 7 (I’m not). I’d be tempted to look at Man City, who face Brighton and then Hoffenhiem in the Champions League. Man Utd’s fixtures don’t look too bad on paper with a trip to West Ham and then hosting Valencia. However I’m personally avoiding their players for now. Chelsea and Liverpool face each other in the Premier League so their players may want to be avoided for now. Spurs have a decent looking fixture against Huddersfield but then face Barcelona in the Champions League. Arsenal could be a team to look at as they face Watford and then an easier Europa League tie. However the only players I’d really be interested in are Lacazette or Aubameyang, and I’d rather not disrupt my front three to get one of these two in. As always, feel free to share your own progress in game week 1 below, suggest any players to look out for or provide any other useful comments below. 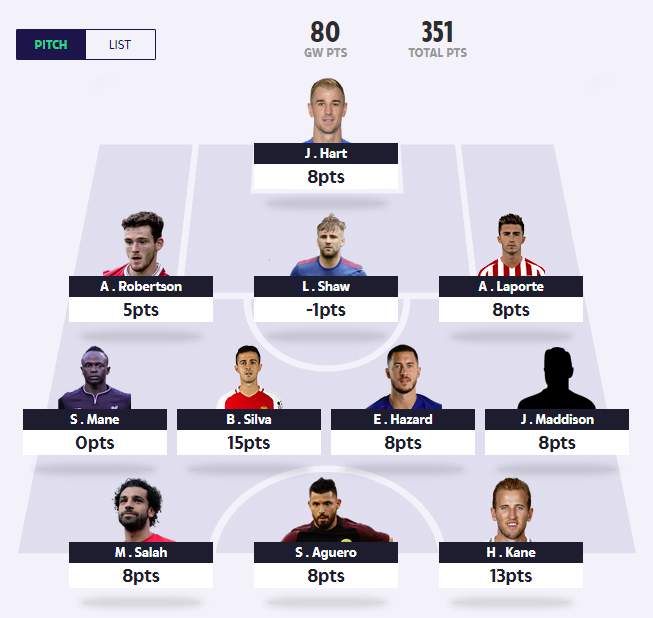 Looks good, v similar team to me except I have Hennessey, ban wissaka, Gomez and Moura and you have Robertson laporte, hart and Madison and I have 351 points lol. It’s probably worth holding it for now. I’d probably only use it if you get an injury. Yeah, I’ve been impressed with Lacazette so far and given his price tag compared to Aubameyang I think he’s great value. Looks to have made the central striker position his own with Aubameyang more on the left. Like you though DTT I’m sticking with the three big guns up front for now. I wouldn’t underestimate Maddison either DTT. He makes that Leicester side tick and with Vardy looking hungry ahead of him there are opportunities for assists, goals and star man awards for him I reckon. Good fixtures for Leicester for a while too. The only two players I’d be considering changing in your team would be Shaw for the reasons you mention, and I’m still not convinced on B.Silva long-term. Man City’s midfield is a mine-field when trying to work out who’ll be playing next. I hope Maddison keeps up his good form but I don’t like having players outside of the top 6 clubs. But we will see. I’m not minding B. Silva at the moment – he’s getting some decent game time but I do question how often he will get a goal or assist compared to other midfielders. Richarlison could be a good option if he starts playing down the middle as well. What transfers are you considering for October? Are you going to list October fixtures for the big teams to base your transfers? I will list the October fixtures. I’ve not really thought about transfers for the month yet. Was going to see how this weekend went first but I’m fairly happy with my team as it is at the moment. 0.8 ITB and 1 transfer let. Any ideas ? Feel like I want to get Sterling in and obviously Hazard is killing me. You may have to sacrifice a defender to get the funds for Hazard he only seems to be getting better this season. Although I see you only have the one transfer left unfortunately. Like dtt said Chelsea go at it again with Liverpool so you could gamble and switch Mane for Hazard just for this month? Or could you play two up front and get Hazard in that way? Who would you sacrifice though? Firmino ? I’m not sure if I’m doing the right thing was thinking downgrade VVD to Roberston this month. Then in Oct Firmino to Salah then Mane to Hazard with 1 transfer left. The only one I’d be wanting to get rid of is Firmino and I’d try and get Salah or Hazard in for him. This might mean you need to downgrade at the back slightly. You never will. Then Richarlison rises 0.1m after drawing a blank. Swapped Shaw for Wan-Bissaka. Had to do it in my eyes, keep dropping minus points in defence. Its a more of a longer term transfer as palace have some nice fixtures in the next few weeks. Couldnt see much else to change, still got arnautovic in my team as i see him getting points. Palace have nice fixtures? After Bournemouth who are no pushovers, it’s Wolves, Everton, Arsenal, Chelsea in the league. Whilst they could be worse I wouldn’t exactly call them nice. Similar boat to you, three transfers this week all paid off and resulted in a GW of 94. Just a pity Mane couldn’t manage any points. Not particularly looking to upgrade my team anywhere just yet, see how things pan out. Agreed 100% with Laca and Auba posing the biggest threat in other teams in my mini league. Hart always a worry but at his price tag he’s returning well. Also concerns over B Silva given the midfield rotation at City, but he is in great form at the moment. Decent team that Dave at the moment. Mendy and Pedro’s recent injuries have reduced my hauls over last few weeks. B.Silva is one of those who you could always swap when you see the team sheet and see he’s not included I suppose. I can see Hart doing well until GW9 when fixtures take a turn for the worse. I’ll move him on then I think. Looks a decent team – hopefully we can have another big game week. You need to get Mendy out mark as he’s not fully fit yet and it sounds like Pep is getting pissed off with his antics (3 hours late to a treatment session). Pedro will probably be on the bench at best I’d imagine. I’d be looking at Richarlison for him. Maybe Trippier for Mendy? Aurier our for a while so Trippiers rotation risk should be reduced. The third choice keeper behind worries me though. Have you considered Doherty of Wolves? Great stats and solid defence. Expected return on Physio Room for Mendy today is 20th October. I’d get rid of Mendy and I’d probably try and move Pedro on if you can get someone decent in at the same price (Maddison, Richarlison). Luke Shaw – Sell Sell Sell!!! United two down at half-time. Steering well clear of United players for the time being. United don’t seem to have many clean sheets in them at the minute though. Better options for similar price out there imo. I’ll hold onto him for one more game week I’d imagine. As I think they play Newcastle next. Damn why did I think Maddison took Leicesters pens? Obviously Vardy is there first choice on pens? Yeah shame it wasn’t a hat trick but delighted keeping the faith eventually paid off. Hoping for more of the same against Cardiff. DTT, bye bye Mendy, for Laporte, what about this Chelsea defence though, Lukaku hasn’t worked, does have Newcastle next week, but Kane has Cardiff, so theirs 2 transfers already, while Shaw plays, leave just have to hope Man utd improve, Pedro & B. silva vulnerable, but will have to hold back 1 transfer. I did Mendy to Laporte a while ago so think this would be a good move. I was very tempted by Lukaku but glad I didn’t in the end. I’m contemplating a wild move with the next transfers… Salah, Moura and potentially Shaw out with Lacazette, Sterling & Luiz. Thoughts? Probably just do Luiz for Shaw if funds allow but wouldn’t use three transfers in one go. Yeah was looking at Salah’s fixtures they do look favourable, he just doesn’t look as deadly as last season. So far that is. Moura also hasn’t looked the same player as we saw away at United. Let’s hope he can get some points at home next week. I’ve only just put Shaw back in but United look a terrible team this season, it’s a shame because Shaw has actually been performing well and is probably their best player. Obviously Kane and Hazard have bailed my team out somewhat this week along with reasonable returns from Aguero and Maddison. The Liverpool Chelsea fixture was always going to be a difficult one to negotiate so could have been much worse off. My nearest rival in my ML is seven points better off so far this week (I’m on 404 he’s on 369 so I still have a decent cushion) with one player each left to play tomorrow. Having both Mendy and Pedro unavailable, I think this is a pretty decent result under the circumstances. Can’t wait for the next transfer window. Really want to get Doherty in probably for Mendy if he’s still out. Another ten point haul from him today. Brilliant defensive and attacking points potential. Impressed with Doherty but Wolves fixtures look tough in November so could be a short term move. Wolves out of league cup which makes it difficult for me to go for him. Can’t argue with Doherty’s attacking potential, gets into the box but he seems to lack the composure to score. I can understand your point to some degree RR, but how many of the top players appear in the League Cup right up until the latter stages anyway? Not many. I’m beginning to realise that defenders who offer attacking returns (ie Robertson, Doherty etc) are what I’m looking for in my team (or at the very least I want a couple of that type). If they can offer attacking threat then tough fixtures can potentially be negated somewhat. I’m considering Doherty as well. Potentially for Shaw. 404 is a decent result considering you’ve had Mendy and Pedro out. I’m only on 408 having managed to get them both out – but did miss the Hazard hat trick. Salah for Sterling next transfer, what do we think? Not for me, Liverpool fixtures get easier next month whilst City’s fixtures go in the opposite direction. Not worried about Salah, he is still getting chances to score. One day it will click for him and he will get a big haul. It will be more worried if he wasn’t getting goalscoring opportunities. Not for me either. I’ll probably stick with Salah for the time being. Let’s all take time to reflect, other than trying to win fantasy football leagues, Europe have won back the Ryder Cup, mauling, routing, embarrassing the yanks, send them home with their tails between their legs, Trump ur boys took one hell of a beating, C’MON. Looked like a cracking atmosphere amongst the spectators. Did you see the Molinari/Fleetwood chant? Brilliant stuff. Tiger who, played 3, lost 3, Poulter taking down number 1 rated player in world D. Johnson, he’s the type of guy you want in the trenches, he invented testosterone, enjoy ur flight home losers, back to business Chris going to have to put Kane back in for Lukaku, & Mendy out for Luiz Tripper, Laporte, add Gomez to go with Robertson, I know you have been championing Doherty, even change formation for Arnautovic, what do you think. So you’re taking out Lukaku, Gomez and Robertson and bringing in Kane, Luiz, Trippier and Laporte? Lukaku out for Kane, Mendy out for Luiz, tripper, Laporte or Gomez, already have Robertson, granted a bit cryptic that. Reckon Laporte could be a good shout to tap into that City defence for a decent price. He seems to be less at risk of rotation than some of the others. I really like Trippier also but the rotation risk bothers me once Aurier is back which doesn’t sound too far away. Lloris is close to coming back so that should add a bit more steel to their defence. However Vertonghen went off injured so that could be an issue. I have Gomez myself but I’m now worrying about his rotation risk also with Matip and Lovren coming back into the fold. Just hope his recent form is good enough to give him the nod. Kane in for Lukaku I’d agree with United look shot at the minute. If it looks like Mendy isn’t returning soon he’s got to go also and whilst I’m not a big fan of Luiz as a player I guess he’s a cheap way of tapping into the Chelsea defence. I’ve been impressed with Rudiger. I get a bit confused with the rest of your post though mate. I need a bit of clarification before I can comment on the latter part of your post David. I’m looking at one transfer into GW8 (probably Mendy to Doherty) then Hart out for probably Foster at GW9 then I’m hoping to hold back the last transfer for when I need it. Using all three straight off killed me this month with Pedro and Mendy getting injured. Lesson learnt. Actually, scrub the Foster idea. I’ve had another look and I’d be able to tap onto the City defence with Ederson with the funds available. Fair point, been clarified now, would be to big a hike for me taking out Hart & putting in Ederson. I’ve risen in my ml which was positive. The Maddison transfer is an ace up my sleeve, he would’ve got star man if ironically he didn’t assist Maguire. I agree with your thoughts on Shaw. I’m going to stick with the Liverpool guys for now as their fixtures ease up a little in terms of difficulty after City. I’d also be looking to move Hart on after the next GW as Burnley’s fixtures take a turn for the worse. I’d be pretty happy with your team though beyond that (for now at least). I’d be tempted to hold fire for another game week and keep your transfers. Looks a solid team. Looks like this is going to be another month where I need to make subs early out of necessity (injuries) rather than strategical planning, based on fixtures! I don’t like months like this because using subs early means that you lose your security blanket, as happened last month with Mendy and Pedro, but needs must. I suppose that one positive I can take is that sub allocation for November falls quite nicely on the 2nd and I will need to be extremely careful with those, because December falls very badly – on the 7th!! I must admit, I quite enjoyed last month. Everyone moved quickly with three transfers off the bat and most got stuck with Mendy and Pedro. I managed to take the both of them out with my September allowance but did miss the Hazard hat trick. Looking at October though I’m fairly happy with my team as it is. Yeh, I suspected he would be out for at least a month. It’s early days to judge, but I’m wondering whether he is going to be another one of these high scoring defenders that is prone to a lot of injuries like VVD, Valencia, Kompany (a season or two back), etc? I’ve read that KDB will be ready for about mid-Nov, so I probably wouldn’t consider him until December unless he comes back earlier. Undecided guys, whether to take out Mendy for Laporte, or Gomez, or change formation to acquire the services of Arnautovic, City & Liverpool 4 games before November transfers, West ham 3, backline currently Shaw, Robertson, Alonso, Mendy, midfield not firing on all cylinders but will leave for now, Hazard, B. silva Pedro, feedback appreciated. How do we read this latest news? Stick? Twist? Having the Liverpool v City fixture as the last PL of the weekend makes it a tougher call. A swap for Laporte I guess would be the wisest thing if he is absent? Maybe things will be clearer after the press conferences later in the week? Urrgghhh, I hate reading news like this! I remember a few years ago, I had Shawcross in my team and he was supposedly coming back every weekend for about 2 months!! Needless to say, I kept hanging on in vain!.. I will keep my eye on it. Thanks Chris. Any ideas of transfers for October? Have you done the fixtures for the big 6 for November? Would be great if Mendy is available at weekend, I don’t even think he’s injured, more displinary, if he knuckles down, almost a sure starter every week, Pep will give nothing away on Friday, so it’s the waiting game, if I could start month with just one transfer, Lukaku back to Kane, that would be advantageous. I Have 1 spare transfer I can make for this month before Friday. Anyone have any ideas. The players I could take out are shaw, vvd or maybe richarlisson but only just put him in. Already have 1m in bank. Not fantasy football related, I have to say that I watched both Manchester games yesterday and the United game was awful to watch. Sad to see what Sanchez has now become. The city I enjoyed, Aguero unlucky not to get more goals. I can’t believe the ref didn’t give foul on Sane by goalkeeper. Most blatant penalty ever seen. Plus getting rid of that rubbish Lukaku this weekend. Might give Pogba another week. I must say that last night was a good night for me!! Not because I earned loads of points, but because others didn’t, so it was successful in terms of damage limitation!! Just been looking ahead to GW 9 (when all of us Hart owners should be looking to move him on) and I was wondering who you guys might be considering between the sticks? Looking at the fixtures from GW 9 onwards I’m getting drawn towards Dubravka at Newcastle. They’ve had a horrible start in terms of fixtures so far, but it’s interesting to note that their three fixtures against the lesser teams this season (Cardiff, Palace and Leicester) they managed a clean sheet in two of those. Newcastle’s fixtures get much easier after United so given that Benitez teams are usually well drilled defensively, do you think he’s a good shout? Also, who else are you guys considering as your keeper? It’s probably not a position I’ll be investing heavily this season in all honesty so I’m going to be scratting around in the budget market I’d imagine. I too have been looking at this and in light of Cech’s injury, was wondering whether Leno would be a decent replacement. Cech is out for about a month and in that month, Arsenal have Qarabag, Fulham, Leicester, Sporting CP and Palace and Blackpool. He’s a bit more expensive at 2.9m, but might be worthy of a punt. For me it’s got to be between Leno or Kepa. Not quite sure how to accommodate Kepa but he’s getting a lot of game time. …Only problem being of course, that another sub would be needed when Cech returns, but if you account for this, it could work, injuries permitting of course. Yeah, he’s also one I’m considering although I still view Arsenal’s defence as being too leaky. As you say, if Cech gets his place back also that could be another transfer which will be required. What appeals to me about Dubravka is that Newcastle (after United) have a pretty decent run fixture wise right up until Christmas. As long as Dubravka chips in now and again to the points tally he could potentially be left in until then, freeing up transfers to be used elsewhere. I might do a bit of a pros and cons list in the most recent thread of mid-range/budget keepers and see if we can get a general consensus from everyone.